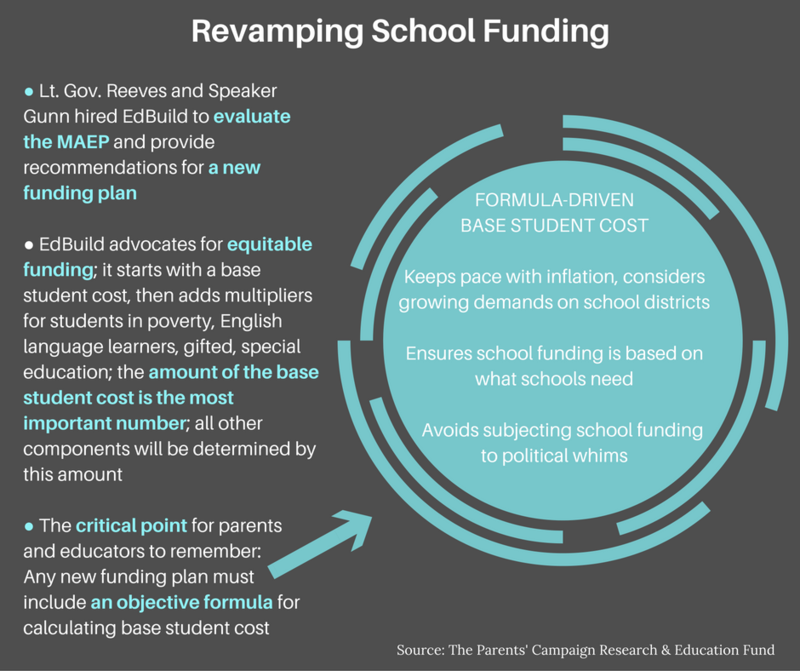 The most critical point of Mississippi’s school funding revamp is getting a formula-driven base student cost that accurately reflects the amount required to provide at least an adequate education for a typical child for the current year and into the future, and that accounts for changes in the cost of education that are due to inflation or new demands placed on schools. Multipliers should be adequate to level the playing field for children with additional needs in order to equalize their opportunities for school success. If EdBuild’s proposal does not include an objective formula for determining the base student cost, the cost will be left to the Legislature to decide on an annual basis. That means there will be no such thing as “under” funding because there will be no such thing as “full” funding. There will be no bar by which to measure the Legislature’s funding decisions or to hold them accountable. Using the multiplier model, if a typical student is assigned a value of 1 (which is multiplied by the base student cost to determine that student’s allocation), a student with special needs might be assigned a 1.5, a student in poverty a 1.3, etc. The value assigned a student with multiple needs could add up to 2 or more, which would effectively double the funding allocated for that student. The base student cost is only a part of the total per student amount appropriated in any state, and those base costs vary widely from state to state, from a low of $2,220 in South Carolina to a high of $11,009 in New Jersey. The “multipliers” also vary widely from state to state. In Alaska, any child who requires special education accommodations, regardless of the type of disability, is assigned a value of 1.2. In Arizona, that child could be assigned a value of 8.947 for special education alone, depending on the specific disability. In that case, the student would receive nearly nine times the amount of the base student cost. Note: EdBuild does not use a consistent fiscal year when presenting this data, not even for data within the same state, so this is not a tool that is useful in comparing the efforts that states are making to adequately fund their schools.